Possibly our stinkiest activity, salmon carcass tossing performs a vital function in the Clackamas Watershed. Historically, salmon would have made it upstream on their own steam. After using their noses to guide them to their home streams from the Pacific Ocean, they’d lay their eggs and perish shortly after. The nutrients from their bodies would make their way into the water column, nourishing nearby plant life and aquatic creatures. Currently, a number of barriers make it impossible for salmon to return to the upper reaches of the watershed, leaving these portions of the Clackamas nutrient-deprived. 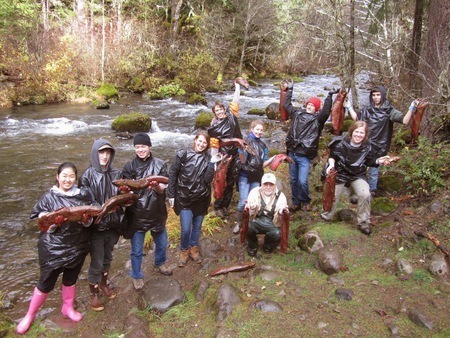 CRBC has worked with partners including SOLVE, Clackamas High School, ODFW, the US Forest Service, and OWEB to place several tons of donated salmon carcasses in Clackamas streams.